The Force is Strong With These Toys: New 'Star Wars' Line is Here! 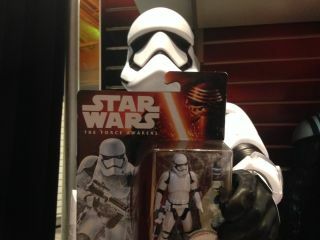 A new line of "Star Wars" toys was revealed at midnight (Sept. 4) at the Times Square Toys 'R' Us. NEW YORK - The Force is strong with these toys. At 11:50 p.m. last night (Sept. 3), more than 200 fans were lined up in front of the Toys 'R' Us in Times Square, waiting for the store's midnight opening, when they'd get a first look at the brand-new line of "Star Wars" toys and collectibles. Inside, a lucky group of fans watched a particularly dramatic reveal of the new toys, featuring a hip hop dance by five Stormtroopers. As you can see in the video above, the section of the store that held the new toys was surrounded by a black curtain. Moments before midnight, a group of five Stormtroopers stepped in front of the curtain and got the crowd a cheering as they performed a choreographed hip hop dance (a video of these troopers doing the same dance went viral in 2014). Then, the black curtain dropped and the toys were revealed. The store was full of costumed characters from the "Star Wars" universe. There were well known characters, including Darth Vader, Darth Maul, and more than a few Stormtroopers. There were also some slightly lesser known characters, like the Jawa and the Red Guard. I ran into a group of Siths and tried my best to blend in. Shoppers who came out to the event started lining up as early as 4:30 p.m. local time. Others said they got in line around 6 p.m., but were in the store hours earlier attending the full day of "Star Wars" related events, including drawing lessons from scifi and "Star Wars" artist Jeff Carlisle, and book signings by Steve Sansweet, owner of the largest collection of "Star Wars" memorabilia in the world. Steve Sansweet at the Toys 'R' Us "Star Wars" toy reveal on Sept. 4. And of course there was the toy everyone has been talking about: BB-8 by Sphero. This toy is both adorable and incredible: It's a remote controlled ball with an independent head piece that somehow stays attached as it rolls around. It's body movements and sounds give it an amazing amount of personality. Here is a video of a bunch of puppies playing with it. Some of our favorite new items included the Lego X-Wing and new build-able Lego characters, the Millenium Falcon remote control drone, and the new line of light sabers. The store carried the fantastic "Star Wars" themed science toys made by Uncle Milton that we highlighted earlier this year. The new action figures were the first items that the store ran out of: Fans cleared away most of them in about 20 minutes. One group of shoppers said they were particularly excited about the new "Star Wars" movie featuring more female characters, and were eager to get the related action figures and toys. One shopper said he was nervous about seeing spoilers for the movie in the new toys, but he came because he "just couldn't miss this." Another fan walked out with three BB-8 toys and two large bags of additional merchandise, and admitted she'd gone over the budget she set for herself (many other shoppers said they also went over their intended budget). The event brought out a wide range of "Star Wars" fans. Some were dedicated "Star Wars" merchandise collectors ("I have a storage unit full of 'Star Wars' stuff," one said), while others were buying their first "Star Wars" items. There were also fans who were "raised on the original trilogy," (referring to the three "Star Wars" movies that came out in the late 1970's and early 1980's) to those those who had been introduced to the franchise through the three prequels (released between 1999 and 2005). You can look at the complete listing of new toys at the Hasbro website. Follow Calla Cofield @callacofield. Follow us @Spacedotcom, Facebook and Google+. Original article on >Space.com.